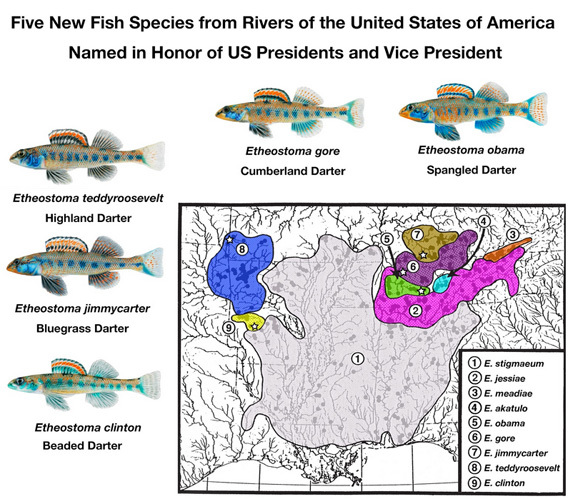 How Obama’s fish made me question my view of "species"
Last year, researchers Steve Layman and Richard Mayden discovered five new species of darter—tiny colorful fishes in the perch family. They named the new species after “environmentally-minded” politicians, most notably Barack Obama (Teddy Roosevelt and Al Gore also made the list). These “new” species had been hiding from us in plain sight—the southeastern US. Five new species of Etheostoma were recently described in the southeastern US. Photos by J. Tomelleri. Source. Wait…how did five unknown fish species go undetected for so long right under our noses? Originally, all five species were thought to be one and the same—the speckled darter E. stigmaeum. This “species complex” represents a case of cryptic diversity. Traditionally, taxonomists relied solely on morpho-meristics—comparative ratios or counts of body parts—to distinguish species from one another. 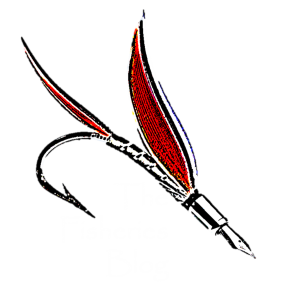 But with the molecular tools available to modern ichthyologists, variation among species can be examined in ways not possible before the mid-1970s. So basically, Layman and Mayden found genetic variation within the speckled darter complex similar to what is typically seen among described species. That, accompanied with noticeable coloration differences in breeding males, warranted their consideration as new species. Black bass in the southeastern US are currently being studied in a similar way. In the past three decades, scores of new species have been described through this process of “splitting” species from one another. Not all biologists agree with every new species designation. Some may argue that distinct morphological differences are only visible during the breeding season. Others contend that because the new species seldom co-occur, the primary thing that makes them distinguishable (other than genetics) is the river in which they were captured…so what if they became introduced in other systems? These differences have divided some biologists into two camps: splitters (those that split into different species) and lumpers (those that lump all into one species). In reality, whether or not you drink the proverbial splitting Kool Aid will most likely depend on which species concept (how a species is defined) you identify with. Three main concepts are described below…which one makes the most sense to you? Biological species concept: Possibly the most widely taught, this concept stresses the importance of separate breeding populations. Basically, if the groups do not interbreed with one another, they are separate species. But if geographic isolation caused the speciation, then how could they ever have the chance to naturally interbreed? Ecological species concept: This concept focuses on the species’ niche or role in the environment. Species are delineated based on their function. Species are further identified by whether or not they would compete for resources (since similar species require similar resources). But what if they use different resources throughout their geographic range or lifespan? Genetic species concept: Under this concept, species are organisms that share the same evolutionary fate through time. For headwater fishes, this is often through isolation. But how do you convince lawmakers all these very similar species deserve unique protection? This is more than a matter of systematics—defining species can clearly have significant regulatory impact (think of the Endangered Species Act). Throw in classifications of subspecies and stocks, and things can get confusing. So before you go pick sides, your best bet is to educate yourself…how would you define a “species”?